Miss 30 Rock last night? It was really funny. Especially since the plot was based on charachter Tracy Jordan's appearance on Larry King Live, and the episode was called "Larry King." Now Tracy's appearance was not a real episode of Larry King Live (you probably figured that out), but some of our staff helped the good folks at 30 Rock, and they got a credit at the end of the show. This is not something we're used to, and Todd was so excited about it he took a picture. To see why 30 Rock is an Emmy winner, and to watch some of this great episode, CLICK HERE. What to do with Nadya Suleman and all those kids? We've got a great panel to debate the questions that have no easy answers. Should she be allowed to keep them? And if so, who's going to help? Doesn't sound like it will be the grandmother. Dr. Phil guest hosts what will be a great, spirited debate on the story everyone's still talking about. And remember, Dr. Phil just had a highly publicized interview himself with Suleman. To see clips from that interview, CLICK HERE! Look for a "Question of the Day" later, but for now, post your comments here and we'll be looking at them throughout the day. POST YOUR QUESTIONS & COMMENTS HERE! What to Call Obama's Plan???? FDR had his "New Deal." LBJ had his "Great Society." Even though it's early, Obama seems to be taking some bold measures. But his strategy needs a name. Post your suggestions below. This is unscientific, unsponsored, and completely irrelevant. But it should be fun. President Obama's first budget - with its eye-popping $1.75 trillion deficit, a health-care fund of more than $600 billion, a $150 billion energy package and proposals to tax wealthy Americans even beyond what he talked about during his campaign - underscores the breadth of his aspiration to reverse three decades of conservative governance and use his presidency to rapidly transform the country. But in adopting a program of such size, cost and complexity, Obama has far exceeded what other politicians might have done. As a result, he is now gambling with his own future and the success of his presidency. William A. Galston of the Brookings Institution cited three parallels to Obama's far-reaching program: Franklin D. Roosevelt's 1932 New Deal blueprint, Lyndon B. Johnson's 1965 Great Society agenda, and Ronald Reagan's 1981 call to dramatically limit the size and power of government, which set the framework for public policy debate ever since. Dr. Phil McGraw didn't hold back in a recent interview of octuplets mom Nadya Suleman and her mother, Angela Suleman. The talk show host had straight talk for Nadya about her having octuplets when she already had six young kids, and about the challenges ahead of her. McGraw says he thinks Suleman is "a very confused young woman. I think, clearly, she is a loving mother. I think she has good intentions, but I think her ability and willingness to grasp the gravity of what's happened here is just really limited. "My problem with her, which I made very clear to her, is not that she went and had eight babies, but that she went and even tried to have one more child. When you have six that you can't provide for, when have you six that you can't pay for and you go down intentionally to have a seventh baby, let alone ... up through 14, then that just doesn't make sense, and that's what I told her. And I think she eventually began to get that, but now she's in this situation, and what does she do about it? 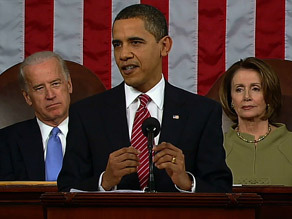 Wasn’t this supposed to be a speech about the stimulus bill? In his first month in office, Barack Obama pushed through the largest expansion of government in human history, yet never bothered to explain precisely how all that spending was going to fix the economy. Tonight was going to be his opportunity to do that, to reassure us that the American Recovery and Reinvestment Act of 2009 is more than a haphazard collection of pork and payoffs. But he never did. Instead, like George W. Bush in the runup to the Iraq war, Obama used fear to silence doubters: “I can assure you that the cost of inaction will be far greater, for it could result in an economy that sputters along for not months or years, but perhaps a decade.” Obey, or we get a depression. And, like the masterful politician he is, Obama sprinkled the speech with enough sweeteners to trigger diabetes: Massive new spending and deficit reduction at the same time. Tax cuts for you, tax increases for people you’ve never met. Peace between Israel and the Palestinians. The end of cancer. Literally: the end of cancer. The list went on. How much of this can we believe? George W Bush will embark next month on an international speaking tour aimed at making him hundreds of thousands of dollars and reshaping his battered image abroad. The former president plans to make about ten speeches over the next year — the first of what he hopes will be many more — at various venues in the US, Canada, Europe and Asia. 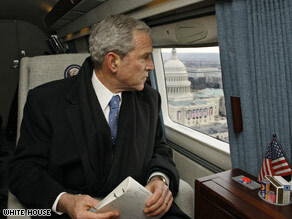 Mr Bush promised at his final news conference that he would keep busy as soon as he left office. He is also working on a book about his eight tumultuous years in the White House and his presidential institute. Its central theme will be liberty. A national poll indicates that two-thirds of those who watched President Barack Obama's address to a joint session of Congress on Tuesday night had a very positive reaction to his speech. Sixty-eight percent of speech-watchers questioned in a CNN/Opinion Research Corp. survey had a very positive reaction, with 24 percent indicating that they had a somewhat positive response and 8 percent indicating that they had a negative reaction. Eighty-five percent of those polled said the president's speech made them more optimistic about the direction of the country over the next few years, with 11 percent indicating the speech made them more pessimistic. Eighty-two percent of speech-watchers said they support the economic plan Obama outlined in his prime time address, with 17 percent opposing the proposal. Do you agree with this poll – leave your comment and let us know! It wasn’t a fair fight. Watching Louisiana Governor Bobby Jindal’s painful, sing-song response to President Barack Obama’s powerful and plain-spoken speech felt like watching an over-eager child trying to box Muhammad Ali. The kid was flailing wildly, while Ali just held the kid’s head at arm’s length, all the while smiling benignly. The kid’s arms whirled like windmills, but he never got close to connecting with the champ. President Obama was confident and compelling; Gov. Jindal had all the saccharine sincerity of a Disney tour guide. Jindal reached his reductio ad absurdum when he suggested progressive and proactive Obama-led government could not be trusted to fix our economic problems because corrupt and incompetent Bush-led government had screwed up Katrina. But if it is Pres. Bush who haunts Gov. Jindal’s past, it is Rush Limbaugh who haunts his future. One of the lesser-known laws of politics is that you can survive your enemies; it’s your friends who do you in. So it is with Bobby Jindal. The governor of Louisiana has come a long way in a little time. A formidable politician, he wrested the governor’s mansion away from Bayou State Democrats. But can he survive the love of the right-wing Republicans—especially their leader, Rush Limbaugh? In a special midnight edition of "Larry King Live," Sen. John McCain reacts to President Obama's first address to congress. 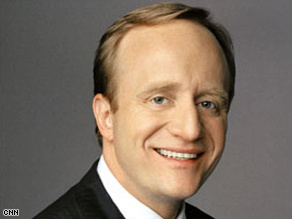 Then Larry hears from personal finance experts Jean Chatzky, Larry Winget and Don Peebles on what the president's agenda means to you and your bottom line. WE WANT TO HEAR FROM YOU! 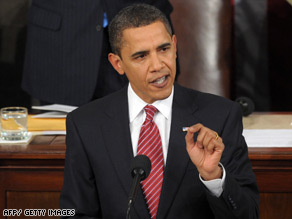 Let us know your thoughts on President Obama's primetime address. Watch the address and then CLICK HERE to tell us what you thought. We just may use your comments on the air tonight in a special edition of "Larry King Live," at midnight, ET.